Is one of your goals to be better at reading the Bible on a more consistent basis? Do you want to grow your faith and knowledge of the Bible in a practical, hands-on approach? Are you ready for God’s Word to become alive and active in a way you have never experienced before? 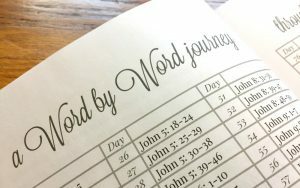 Scripture Graces: A Word by Word Journey Through the Bible is the devotional tool designed just for you! This daily devotional journal will help you spend time reading and engaging in God’s Word in just a few minutes each day. Designed to be both a place to record God’s Word and journal your prayers, deeper Bible study or anything else on your heart. Each 2-page spread is designed to give you just the room you need! 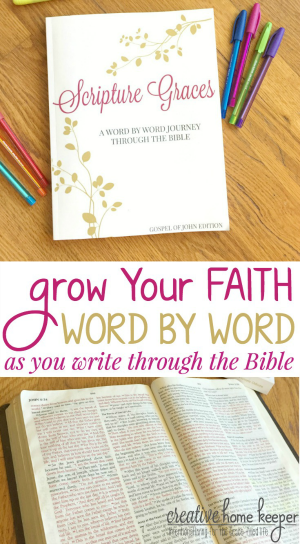 Grow in greater understanding of the Bible and slowly move through the ministry of Jesus’ life on earth through Scripture Graces, The Gospel of John Edition. 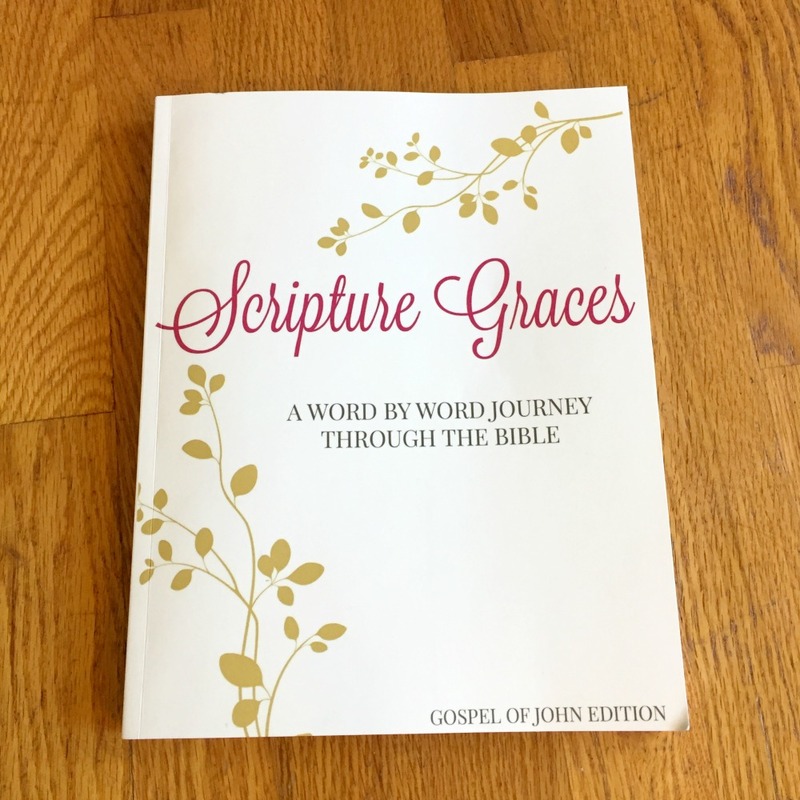 Scripture Graces is an actual printed paperback book, measuring 8.5″ x 11″. Order it today and it will arrive in your mailbox in about 2 weeks! You can also purchase the digital PDF version of this journal for only $15 right HERE. 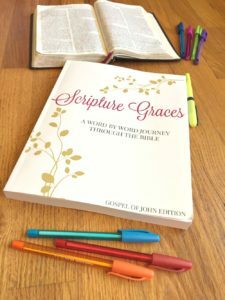 Scripture Graces, The Gospel of John Edition, is a keepsake journal designed to walk you through the entire book of the Bible writing out small sections of Scripture and room for journaling each day. It is a paperback book, with perfect bound bookbinding, that will be mailed to your home after ordering. 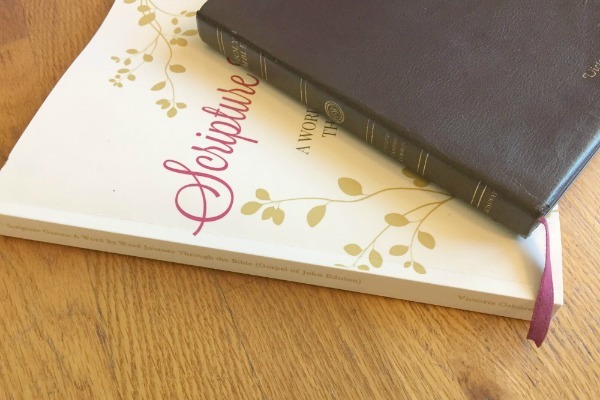 It is printed in black and white, with simple lettering and design to allow you plenty of room to journal, draw, or doodle as you go further into your time of studying the Gospel of John. Would you like to take a little peek into the heart of the planner? Below is an example of what each two-page spread will look like as you move through the journal. 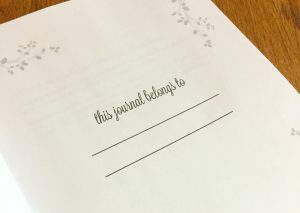 There are no dates so you can move through the journal at your own pace throughout the year. On the left side is where you will write your Scripture Graces. The 21 chapters in John have been broken up in small, daily writing excerpts. Each day also includes the specific Bible verse so you don’t have to flip back and forth. On the right side is where you will write your Daily Graces. This is where you can go further into the Word through Bible study, journaling, prayer or anything else on your heart. Both pages are purposely left unlined, giving you the freedom to transcribe these verses in your own unique way. Scripture Graces also includes a 137-day writing plan. Each chapter of John was purposely divided up into small portions to be written out in just a few minutes each day. The two-page table found in the front of the journal allows you to check off the daily writing assignment as you go. 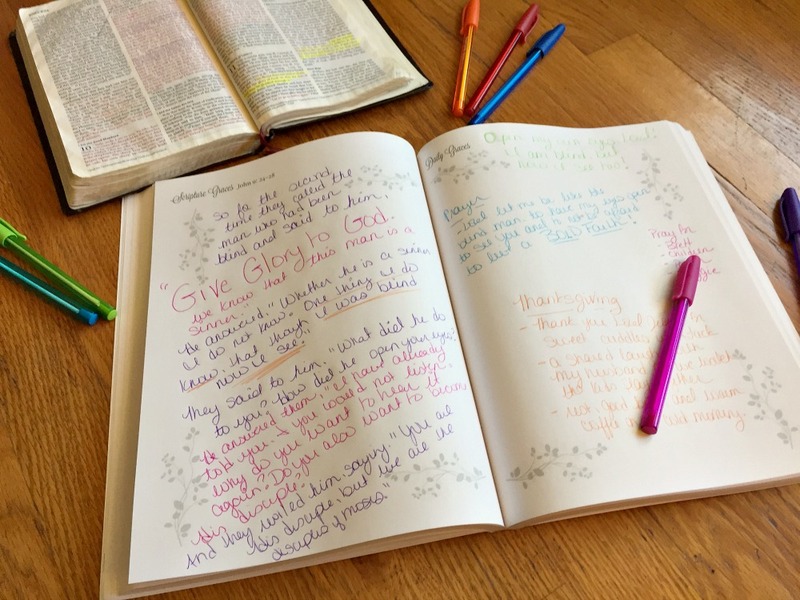 Make your Scripture Graces journal a beloved keepsake by filling in your name, beginning date and date of completion on the customizable name page. This special page in the front of the journal also transforms this into the perfect gift to give to a dear friend. 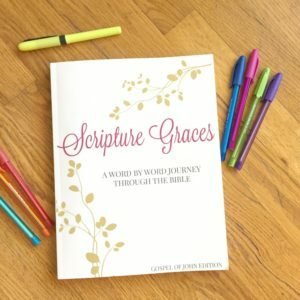 Scripture Graces is a physical journal that will be mailed to your home 1 to 2 weeks after ordering. 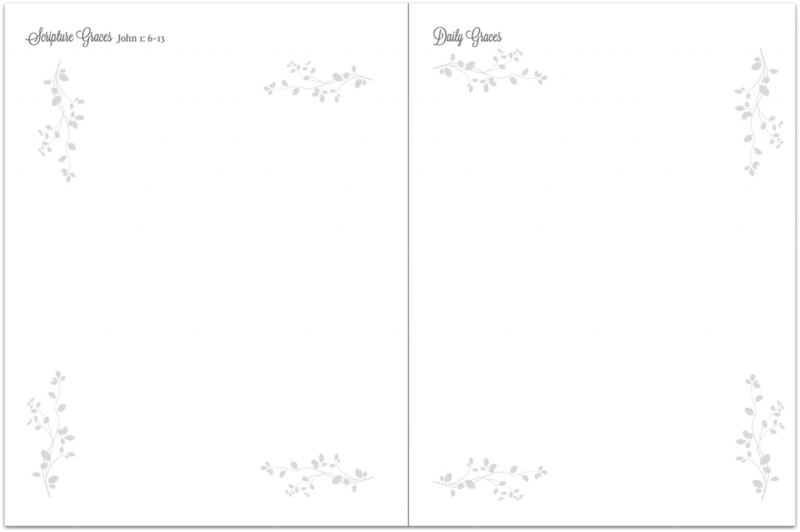 The inside pages are simple and printed in black and white to give you plenty of room to write out the Scriptures and journal or draw. The journal measures 8.5″ x 11″. It is a perfect bound paperback, with a durable, glossy cover. It is 296 page, which also includes several full-page Bible passages to help prepare your heart. 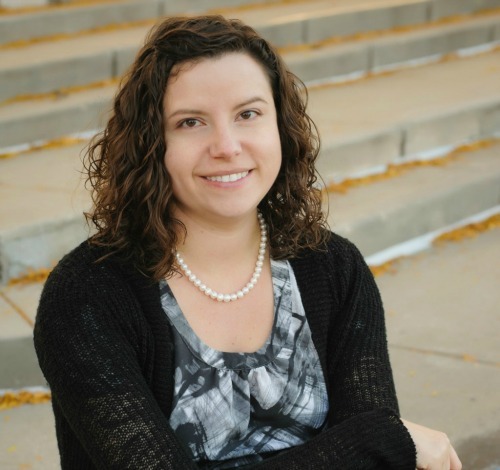 Hi, I’m Victoria, the founder of Creative Home Keeper, a faith & lifestyle blog designed to help women aspire to be more purposeful & filled with joy. 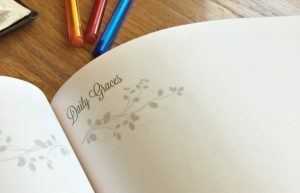 CHK provides grace-filled tips and resources to live a more simple, intentional & devotional life. Whether that be at home or out in the workplace, I firmly believe that when we live with intention and purpose, we are able to accomplish much more than we ever thought possible. When I’m not blogging (or chasing after my crew), you can find me with my nose in a good book sipping on a hot cup of coffee. You read more about CHK, me & the other resources I offer HERE. 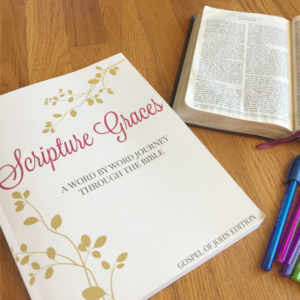 Creating Scripture Graces has been a labor of love, and a project I am deeply passionate about. It is my sincere prayer, that this daily devotional tool will help you dig into God’s Word like never before! Thank you for being a dear supporter and reader here in this ministry space. It is such a privilege to share the blessings God has planted in my heart with you! Before you go, can I ask you one more favor? If you know someone who could benefit or be blessed by engaging with the Scriptures in this simple, yet impactful way, would you mind sharing it with them? I would be ever so grateful! Do you still have a question about the planner? You can submit your questions HERE. 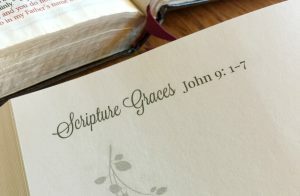 For more resources & inspiration to grow y0ur faith, develop a daily habit of reading Scripture & to understand the value of writing the Word daily, be sure to visit the Scripture Graces resources page.